Modern-day business means you’ve got a functional operation going on, you’re able to reel in new sales, and your workforce is productively powering through each day. But beyond that, real success also comes down to dominating the digital space – and that doesn’t come easily. No matter the size of the company, businesses from all across the world are spending more and more on their online presence. In 2017, for example, global investment in online efforts hit approximately $100 billion. A significant portion of that has always been allocated to web design, as brands look to redefine their image and refine their professionalism. But with so much investment floating around, how do you know if it’s worth putting in the hard-earned dollars towards professional web design, or if it’s wiser to opt for a DIY site builder? Here are 12 reasons why you should hire a web designer in 2019, instead of taking the leap yourself. Digital marketing is one of those things where you really have to nail it on the head through a holistic approach. Honing in on one aspect is great, but connecting them all together forms a hard-hitting strategy that competitors often struggle to match. From social media, through to e-commerce and mobile apps – your website needs to integrate all channels into an easy-to-access platform for users. Website builders can often do this, but keeping stable connections and ensuring functionalities are consistently operating, is a hefty task. Beyond that, your site needs to display all of this neatly and should be well-aligned with your strategy. From branding and shopping experiences, web designers can ensure conversions are given maximum potential across the board. There’s no doubt the likes of Wix and Squarespace are handy for throwing together a simple site, but for more complex sites, you’re going to need a coding expert or professional web designer to take the reins. You don’t want to be held responsible when the site goes down because some HTML isn’t sitting right, and if you’re not sure how to fix it, it could be detrimental to your sales and conversions. Additionally, simplistic builders often don’t have the capabilities for you to efficiently edit back-end coding at all, meaning the amount you can do with your site is significantly limited. Builders like Wix are out-of-the-box solutions that don’t say much about your unique brand. If your users can’t flow through the sales funnel of your website seamlessly, your platform’s not doing much for your business at all. Consider walking into a large store, where there is a lack of signage, not a whole lot of staff hovering around, and the organisation is overwhelming. How long would you stick around hunting down the product you’re after before you give up and walk out? As users become more time-poor and frustrated with load times, complicated websites and confusing content, it’s critical to have a web designer on-hand who can ensure the entire cycle is given the best shot at success. That also means testing and ironing out bugs to eliminate any risk of prospects straying away from the site for good, creating a hassle-free experience that enhances your bottom line. It’s an obvious one, but a site that’s professional-looking, easy to handle and able to engage users means it’s more likely to convert. Free website builders often only provide a cookie-cutter approach that’s not able to be personalised to your specific needs. If users can’t access the information they’re after or find it confusing to understand what you’re all about, it’s inevitably going to be a reflection of who you are as a business. Add to that the fact that creativity is often the missing ingredient with these builders, and you’ll quickly find yourself on the hunt for a specialist who knows how to tap into their artistic flair. Create the perfect first impression with a sleek, highly optimised website from an expert who understands user psychology and behaviour, allowing for better experiences overall. 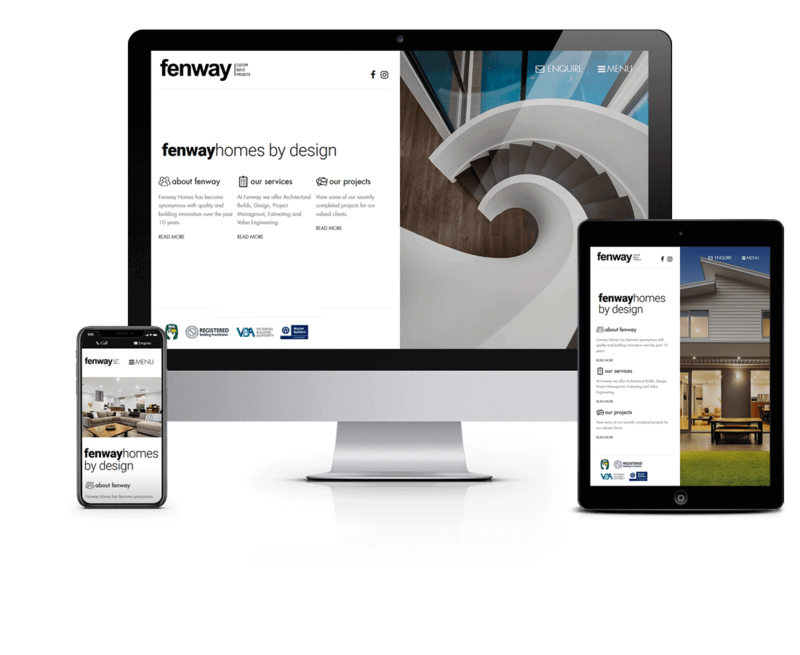 Our customised website solution for Fenway Homes allowed the brand to achieve a split-screen to balance easy scrolling, prominent visuals and easy-to-read text. Just like you wouldn’t stick around in a store you couldn’t navigate, you wouldn’t waste your time on one that was unkempt, empty and unattractive. The same applies to digital storefronts and business websites, where creating an attractive, engaging presence is vital. Add to that the fact that 38% of visitors say they leave a website if it’s unappealing, and 94% claim a site’s first impressions contribute to whether they invest engagement in a brand or not, and there’s suddenly plenty of reasons to ensure your platform is up to scratch. Avoid this altogether by employing a web designer who knows how to create the perfect brand image straight off the bat. Website design is a living and breathing field – there are trends to keep on top of, and new functionalities that power up business off all industries. Builders often aren’t equipped with the resources or capabilities to keep up with these changes (or at least, not fast enough), meaning your business is likely to lose out on innovation. Professionals, like all marketers, keep themselves in-the-know with what layouts are reaping the best engagement and conversions, what mindset users are most likely in and how the functionality will work across devices of all forms. It’s no secret Google favours mobile-friendly sites over those that aren’t. While some builders allow you to tap into this, some are not-so-great at applying these features. Ensuring your site can be accessed on all devices is critical, not only for user experience but for SEO efforts as well. Beyond that, platforms that can be tweaked and efficiently altered in the backend mean SEO experts can get to work easily, optimising your site where it needs work. Builders sometimes block these areas, preventing you from improving rankings on search engines. If you’re running a business, chances are you won’t even have time to sit down and think about designing a website anyway. Instead of spending your downtime trying to throw something together, make sure it’s done right by letting a website designer take on the hard work for you. When it comes to having a live website, there are so many things that can go wrong when you really don’t want them to. From broken coding through to malware, hosting issues and server problems – you’ll always need for support somewhere down the line. Opting for a professional web designer means you’re backed by the assistance you need to ensure zero downtime for your platform – something builders often lag in. Avoid this dreaded screen with an expert web designer. Sites aren’t a set-and-forget option. As you grow your business or your website ages, there will always be the need to apply necessary updates and maintenance along the way. From keeping security elements up-to-scratch, through to optimising content and refreshing information – it pays to have someone on board who can quickly nut these out for you. Users won’t sit around waiting for a website to load. In fact, 47% of users expect a site they’re viewing to appear within two seconds. If your site isn’t adhering to these timeframes, you’ll quickly lose prospects that may have otherwise turned into conversions or loyal audiences. Additionally, builders are often not equipped with the functionalities to ensure best possible load speeds, meaning the money you’re spending on pouring traffic to your website is lost once they hit the actual page. Professionals like those at Website Design are backed by the ability to offer clients 24/7 support and self-updates. With a handy CMS readily accessible, business leaders can log into their platform and adjust their website to their needs, all the while experiencing a best-in-class team to oversee the entirety of the site. If you’ve got any problems along the way, their knowledge and skill sets are ready and raring to eliminate all challenges – something web builders aren’t able to offer. Looking to give your website a refresh but aren’t sure what option’s the best one for you? Get in touch with the experts at Website Design on 1300 367 009 for a no-obligation discussion on the many benefits of hiring a specialist over using a DIY platform. Let us guide you through the process of creating a powerful, conversion-generating website that delivers on your ROI.